Call of Duty: Modern Warfare 2 remains the most popular game played on Xbox Live since its launch late last year, but that doesn't mean that the fans of the fast-paced, first-person shooter couldn't use some new ways to play. Enter the Stimulus Pack. The first Modern Warfare 2 map pack, coming to the Xbox 360 a month before any other platform, comes with just five new killing fields: Crash, Overgrown, Bailout, Salvage and Storm. Two of those maps, Crash and Overgrown, are fan favorites pulled from Call of Duty 4: Modern Warfare's multiplayer experience and retooled for the sequel. And they'll set you back $15 USD. Could a pack of maps be worth a quarter the price of the full game? Let's see. Visual Variety:The three new maps included in the pack are an eclectic mix of city scape, junkyard and industrial park, all loaded with detail. I particularly love the rolling sheets of rain and lighting of the aptly named Storm map. The snow-dusted fortified junkyard of Salvage is a stark setting, and the apartment complex and empty swimming pool of Bailout give you plenty to scan during play. Combined, the maps of the Stimulus Pack do much to broaden the visual palette of Modern Warfare 2's online play. Tactical Tuning: The maps of Stimulus Pack aren't just pretty to look at, they were also each designed to try and stop certain in-game play styles. For instance, the perches that can be found along the roofs of Storm can help shift the tide of a battle if commanded by a talented sniper. Bailout's inside and outside sections force players to shift between long range and close range weapons and Salvage's lack of buildings and maze-like junkyards is great for fast and deadly play. The Price: And really, it all comes down to this. Is it worth $15 to add five maps, two of which you've likely seen before, to your Modern Warfare 2 experience? Put another way, the original Modern Warfare 2 game was a $60 title. Dropping that cash gave you 16 maps, and an six to eight hour single-player campaign. Paying that price for nothing more than five new maps seems absurdly out of whack to me. Ignoring the price, the Stimulus Pack offers the online, multiplayer Modern Warfare 2 experience a breath of fresh air, with new settings, new places to explore and build tactics around. But it's hard to ignore the $15 price tag. If you can, the maps are a finely-tooled collection of places to play. When I spoke with the development team about the pack they told me that it was called a Stimulus pack because it was designed to stimulate interest in the title. At $15 though and with no other additions in the pack, it feels more like it was meant to stimulate earnings on Activision's quarterly report. 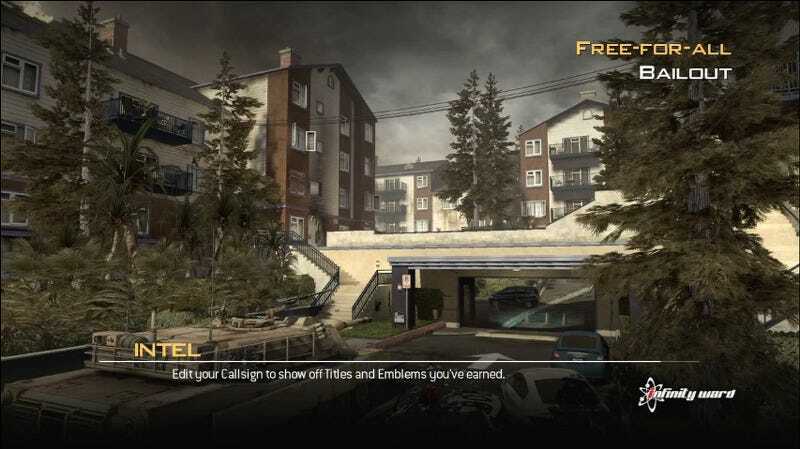 Call of Duty: Modern Warfare 2 Stimulus Pack was developed by Infinity Ward and published by Activision for the Xbox 360 on March 30. Retails for 1200 Microsoft Points ($15 USD). A code for the download pack was given to us by the publisher for reviewing purposes. Played all five multiplayer modes multiple times.